Amish Macaroni Salad – For your outdoor events, skip the hot sides and instead enjoy the creamy coolness of this classic summer macaroni salad. Like almost every American kid, I grew up looking forward to Memorial Day and 4th of July picnics. I mostly remember them being hot. Us kids would spend picnic afternoons running around in the grass that my dad had freshly mowed until the grass clippings stuck to our sweaty foreheads. We’d all play a horribly embarrassing game of croquet after which the grown-ups would sit in lawn chairs and drink from cold cans of beer that dripped with condensation from the hot and humid Philadelphia air. If we weren’t too annoying we could talk my parents into letting us play in the sprinkler. That didn’t always work out for us though… Fortunately, once the sun set the heat and humidity would settle (a little) and the fun could really begin. We’d have a family picnic followed by lightning-bug-catching, bottle rockets, and sparklers. It was everything an American kid could want from a hot summer night. My family always put on quite the picnic spread. 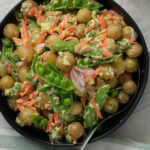 The hamburgers and hot dogs were always great, but my favorite part of a summer picnic has always been the assortment of cool homemade salads. In addition to tasting great, they keep you feeling cool. Over the years I’ve been more of a pasta salad kind of girl, as opposed to the ubiquitous Amish Macaroni Salad, which I’ve always found just a little bit boring. That’s why the recipe I’ve developed for my blog is more of the “loaded” variety. It has tons of celery, onion, and red and green bell peppers, but the key is in the dressing. In addition to traditional mayo, mustard, and white vinegar, I added sweet relish and celery seeds. 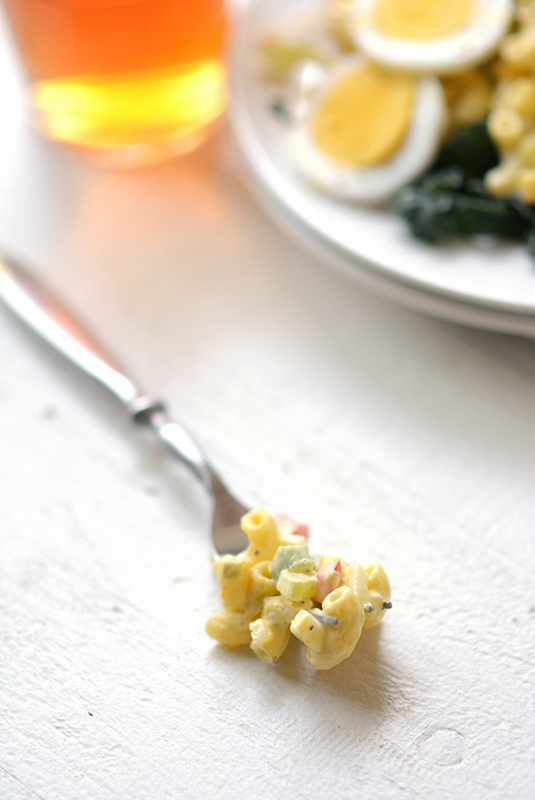 The end result is a flavorful sweet and tangy Amish Macaroni Salad that’s also popping with crunch. Now I don’t think I can choose between the pasta salad and the macaroni salad at our family summertime picnics. Fortunately, I don’t think there’s a picnic rule against taking a little of each! 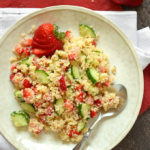 For your outdoor events, skip the hot sides and instead enjoy the creamy coolness of this classic summer macaroni salad. 4 finely chopped hard boiled eggs plus 2 more for slicing as garnish if desired. Place 4-6 eggs in a pot of cold water. Bring to a boil over high heat. 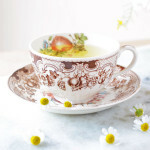 Once boiling, turn off the water, cover the pot, and allow the eggs to sit in the hot water for 11 minutes, then place the eggs in an ice bath or rinse with cold water until they are cool. Refrigerate until you are ready to use. While the eggs are cooking mix together all of the dressing ingredients in a large bowl until smooth and then set it aside. Bring 4-6 quarts of water to a boil in a large pot. Add 1 Tbsp of salt and then add the pasta to the water. Boil the pasta according to the package instructions until it is al dente (approximately 7 minutes). Drain the pasta and lightly rinse it with cold water. Allow the pasta to come to room temperature before incorporating it into your salad. While the pasta water is heating and the pasta is cooking, chop all of the vegetables. Fold the cooked and cooled pasta into the dressing. Next, fold in the vegetables. Finely chop the eggs and fold them in. Serve immediately, but it is best served chilled. Store in the refrigerator for up to five days. 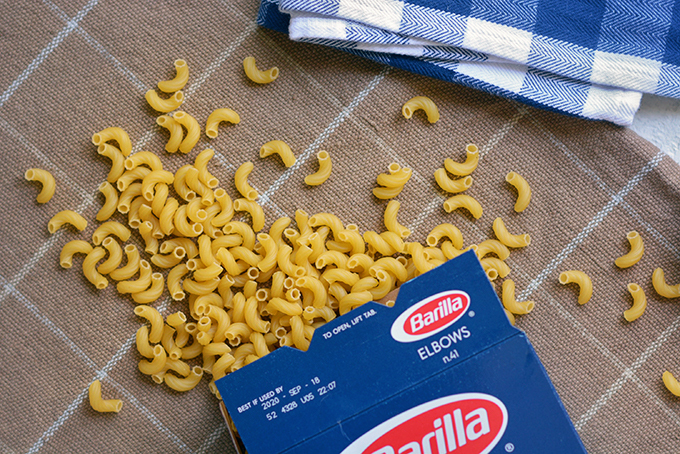 *I prefer the version of elbow macaroni that Barilla produces as it has indentations in the pasta that hold onto the dressing. Get Your Next Meal In Your Inbox! Enter your email address to get the latest recipes, as well as exclusive content just for subscribers! We just had our long weekend, but I don’t think it is as big a deal in Canada as your long weekend is in the States. I feel like you guys go big on your holidays! This looks so good. 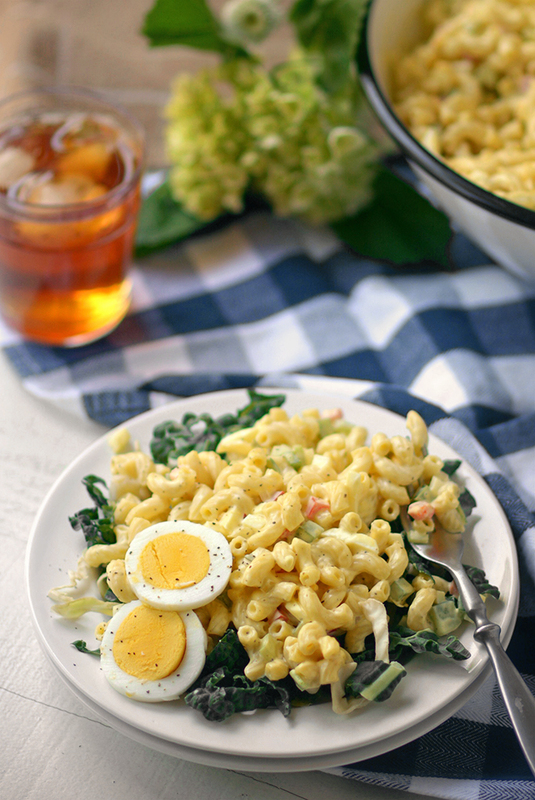 I have never made a macaroni salad, but would love to try it sometime! I think American’s like an excuse to party! In the US Memorial Day is considered the official start of the summer picnicking season, which I personally feel is a reason to party! I have family from Canada and they never make a big deal of the holidays. Not even Christmas! Their idea of celebrating is snow birding down to Mexico, which I suppose is kind of awesome in it’s own way! 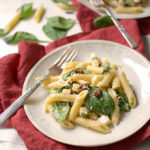 I agree – I always tend to think the Amish Macaronis Salads are boring and tend to skip over them, but i love all the tang and crunch you added to yours! Can’t wait for fun picnics to try this out! Yeah… I’m pretty particular about macaroni and pasta salads… but this one met my exacting standards! I am on a whole 30 kick but this salad sure is tempting me. Maybe for a crowd or holiday, I can cheat! I don’t want to encourage you to break your diet, but 30 days isn’t so long to wait to try some macaroni salad! Maybe by the 4th of July?! This sounds so flavorful and delicious. Can’t wait to give this a try. Yuuummm! 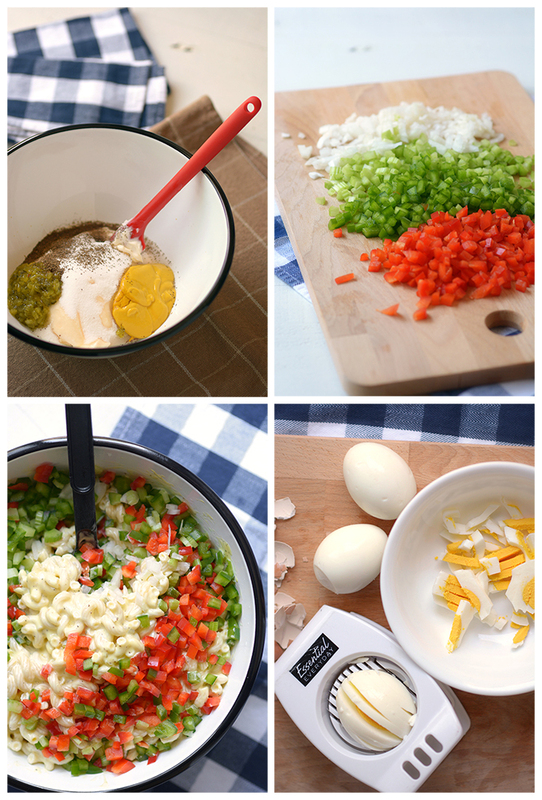 Bell peppers and eggs are great additions to macaroni salad! I can’t wait to try this. Yes! I need a pasta salad with lots of crunch! Loving all the add ins to your macaroni salad here. I usually assign this job to someone else since I don’t eat pasta salad often, but I look forward to trying this! 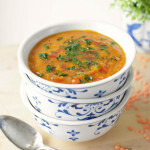 It’s perfect with all things grilled! The best thing is that it’s pretty simple and easy to make! 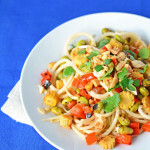 This pasta salad looks insanely delicious and flavorful! I’m always looking for new dishes to bring to summer cookouts and this couldn’t be any easier to make! It really is easy to put together, but shhh… now one needs to know that at your next summer cookout! Haha! The thing that makes it “Amish” stems from the fact I’m from Pennsylvania which has a huge Amish and Pennsylvania Dutch community. 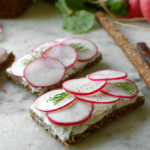 I’m personally not Dutch in the least, but my husband grew-up in a community surrounded by Amish farms so I’ve been experimenting with some recipes from my husband’s childhood. This particular one is a keeper. 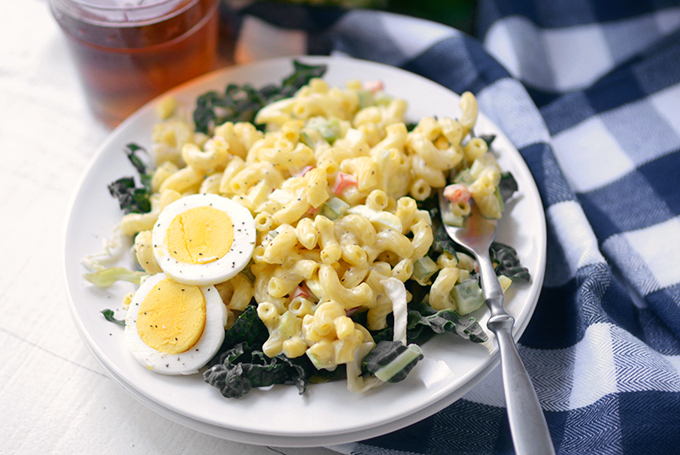 The “Amish” part of this salad is in reference to a macaroni salad that has eggs and relish in it. 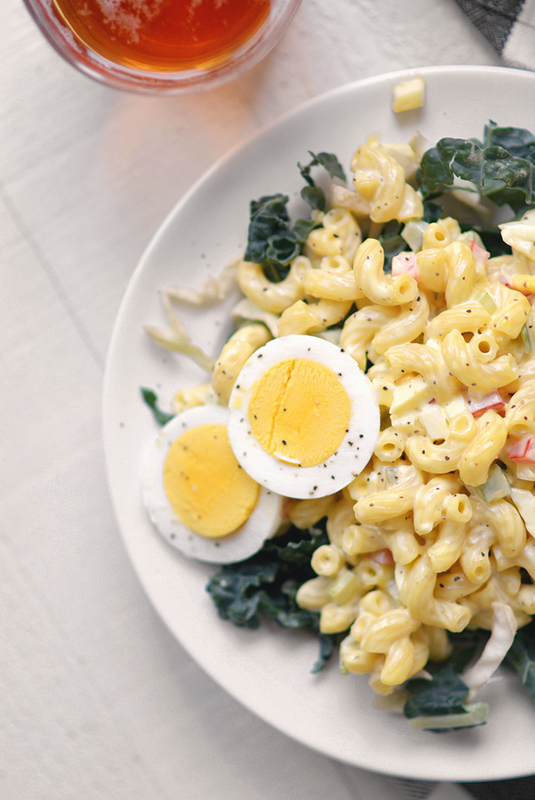 It’s both more tangy and more savory that many other macaroni salads. I hope you enjoy giving it a try! That sounds interesting. 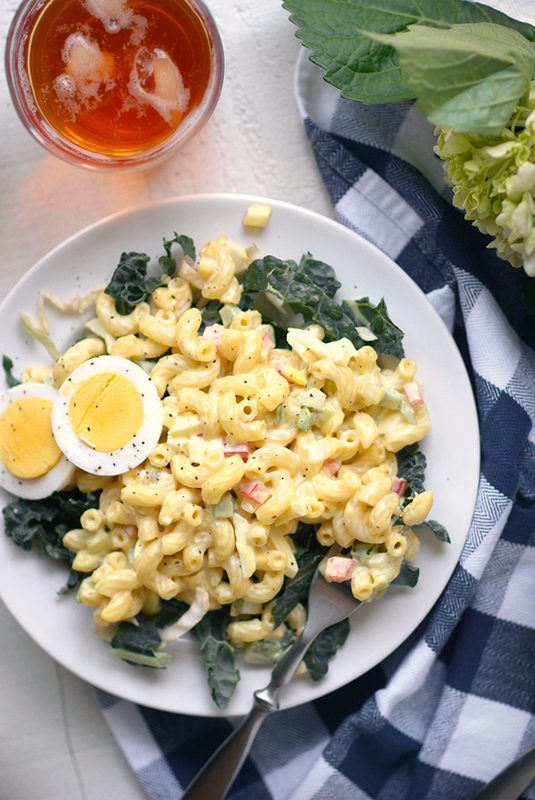 I’m also not really a macaroni salad fan, but this has more going on in it than most… Tempting! You should give it a try! I hope you’ll be pleasantly surprised! That looks so creamy and yummy! 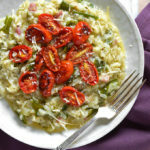 I’m not usually a pasta salad fan, but I would definitely love to eat a big bowl of this! I’m usually with you in the not being a pasta salad fan club, but for this one I make an exception! I do not eat eggs, so if I end up making this I would have to replace the eggs and the mayo, any suggestions? You can replace the mayo with a egg-free alternative mayo like Just Mayo or any of the other Vegan alternative. As far as the eggs themselves go, they can be omitted. The salad won’t be as rich as a result, but it should still taste good! I was skeptical at “Amish” but I really liked the words macaroni and salad. So glad I caught this dish. LOL… I don’t typical equate “Amish” with fine dinning either. I’m from Pennsylvania and this variation of macaroni salad with the sweet relish and eggs is often referred to being “Amish” style.